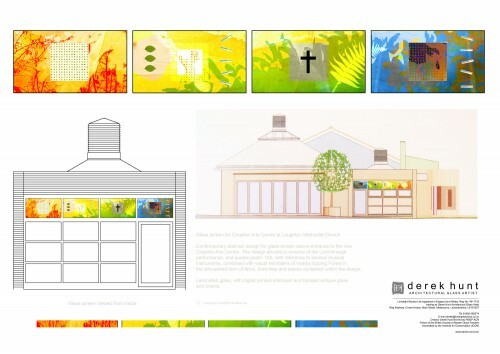 I was recently ask by the very welcoming and friendly Loughton Methodist Church to design and make four windows for their new Creative Art Centre in Epping Forest, London. In partnership with the Christian Drama Resource Centre, the Church has embarked on an ambitious new project to build a purpose made Centre for the Creative Arts. Working with the community and local schools, the Centre will perform a variety of roles including theatre, dance and drama outreach work. Its a lovely project, and should be completed by May this year.